The first part arrived today! No longer just a bunch of penciled lines drawn on paper, this antenna project is starting to come together. My patient wife took this picture right after I tore into the package. 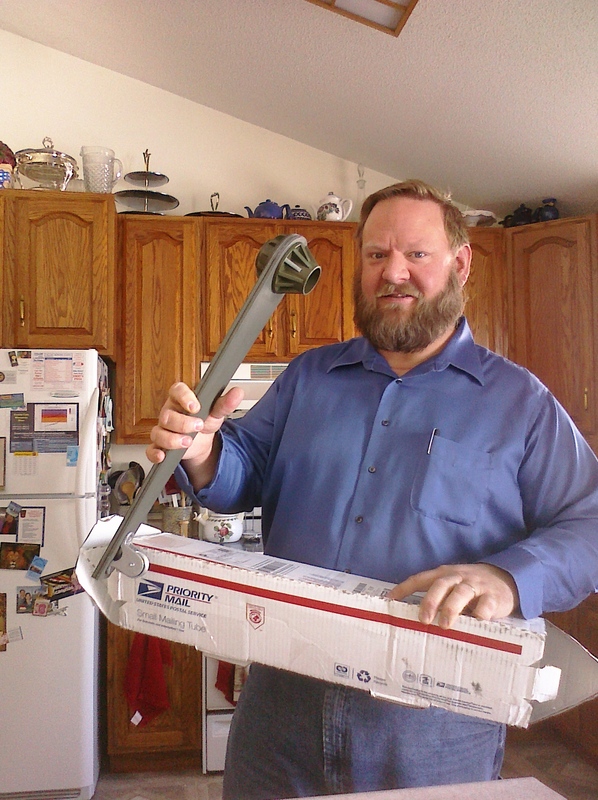 What I’m holding in my hand is something I found on ebay, sold by NC4RY: a “Dipole hanger for the 4′ mast poles, offset with pulley.” It was only $22.30, shipped, and it is supposed to fit on top of the 1.75″ O.D. 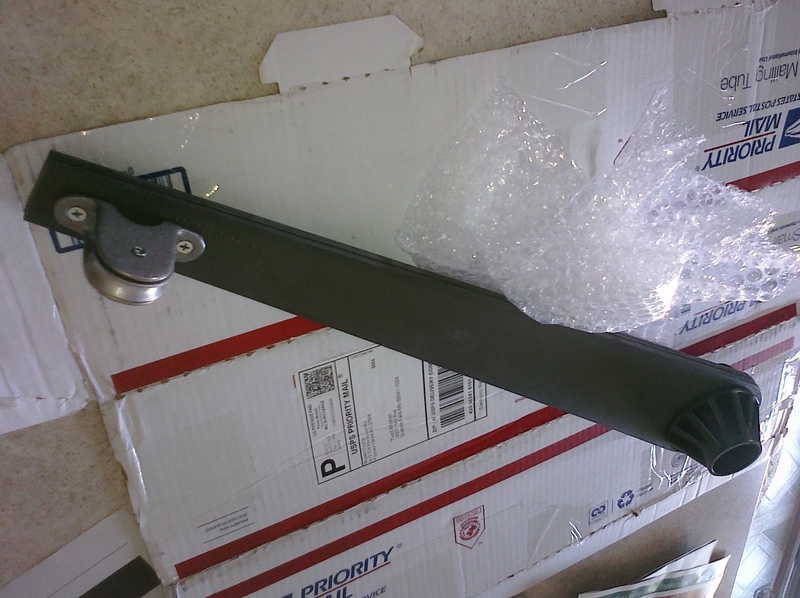 aluminum military mast that I’ve ordered from K4TMC. Hopefully this hanger will save wear and tear on the balun at the feedpoint of the antenna, which would otherwise be banging against the mast if it was hung right from the mast itself. It will also hopefully save wear and tear on our ears. I’d rather not hear the balun slapping around up there, not to mention the halyard. We enjoy hearing halyards slapping against masts at a marina, but we’d rather not have that going on right over our bedroom! This offset hanger should solve both these problems. The antenna I’m planning to hang from this thing is a 40-10m New Carolina Windom, hung as an inverted-V with as shallow of an angle as possible. (If you’re paying attention, you’ll notice that I’m planning on putting the off-center feedpoint at the apex, which I’ve read is not ideal. More on this and my reasons for selecting the New Carolina Windom in another post.) I’m planning on homebrewing the antenna, so the next shipment I’m eagerly awaiting is Understanding, Building & Using Baluns & Ununs, by Jerry Sevick, W2FMI. Before I cut any wire, I want to have the 4:1 current balun and the RF choke ready to go. I’ve only wound one balun in my life, and I barely had a clue what I was doing, so I figure I better read up on it. Between the cost of the book and materials, I know I might not be saving much over a commercially-made balun. But this way I’ll learn something in the process! Isn’t that what real hams are supposed to do? I’d rather not just be an appliance-operator. Another shipment arrived today, too — the inexpensive but high-quality Velleman VTSS5U 50W Solder Station. I ordered it on the recommendation of WB5RVZ for working with surface-mounted components in the thrifty Softrock Ensemble RXTX kit that should arrive next week. These Softrock radios are an amazing buy. You can catch a glimpse of what they can do on W4AX’s spectacular WebSDR page. Make sure you click on “View | all bands.” He has four $20 Softrock Lite II receivers operating simultaneously, served up on this page from a Linux/Ubuntu server in his mind-boggling shack. Eventually I’ll make a trip to Radio City for antenna wire, coax, a tripod mount, connectors, etc., but it’s fun to order these things on the web and watch them trickle in via USPS, UPS, and FedEx. After years of infrequent use, my radios finally wound up in boxes when I moved from the Twin Cities out to Granite Falls, MN a couple years ago. But recently, I got the itch to set them up again. This time the itch started when I had to renew my license, about a month ago. Something about getting that renewed license in the mail brought back fond memories of soft static from my old Hammarlund HQ-170A, hearing CW while tuning up the Heathkit DX-100 for another evening in a world that few of my friends could understand. Suddenly, I wanted to feel the straight key and the paddles moving under my fingertips again, with my finger on the dial of my Kenwood TS-430S. But until I got an antenna set up, that would have to wait — and there wouldn’t be any antenna-work until the snow melted. In the meantime, I’ve been savoring the process of preparation for that day. It’s been a treat mulling over an antenna design while tracking down the boxes with my equipment in them. While chafing at the wait I even bent to the task of studying for the Extra Class exam, and last week made the trip to the Twin Cities to take it. It all happened so fast that I’m still a bit astonished; it’s hard to believe that after all these years, I finally hold an Extra Class license. The first person I called was my father, NØARQ. If it weren’t for him, I probably would never have become a ham 33 years ago at the tender age of 10. I only wish I could have shared the news with my Elmer, Joe McDonald, WØIYT. I lost touch with him years ago, and now he’s a silent key. But that brings me to the point of this blog. I want to do for some budding ham what Joe did for me. I want to be an Elmer, not only because I want to give something back, not only because I feel like I owe it to my fellow hams, not only because I fear that my beloved CW is dying out, but because I want to do everything I can to rescue ham radio from what it has become. That may sound a bit grandiose to some, and perhaps more than a bit quixotic to others, but there it is. Frankly, it is as much selfish as it is selfless. You see, I don’t just want to rediscover ham radio. I want to rediscover the ham radio that once was, but is now hard to find. The only way that’s going to happen is if we have a significant culture change on the airwaves — and the only way I can think of to do that is to help one ham at a time. I want to do my best to start new hams in the right direction, to help them imagine ham radio for what it could be, not for what it is. This blog will be about my journey to get back on the air, get my skills polished up, and find someone to Elmer. Along the way, I’ll reminisce about my own experience in ham radio, and I’ll critique the state of ham radio today. I’ll also venture an opinion on how we got here, and what it will take to improve the hobby. Comments are welcome from all who deport themselves as ladies and gentlemen. May we converse here the way we ought to be having our QSO’s — charitably, humbly, thoughtfully, and constructively.